Here's where to watch every episode of Critical Role season 5. Mouseover or tap an episode to see where to stream it. Click or tap the play icon to stream it on the best available service. Episode 57 - Duskmeadow Jun 16, 2016 The battle wary group return to Vasselheim as Vax brings himself face to face with the Raven Queen. Episode 58 - A Cycle of Vengeance Jun 23, 2016 The Rakshasa comes to Whitestone looking for vengeance as our heroes prepare for their journey into the Feywild. Episode 60 - Heredity and Hats (live) Jul 14, 2016 Vox Machina makes their way into the elven City of Syngorn to complete their pact with Garmili the satyr cartoonist. Episode 61 - Denizens of the Moonbrush Jul 28, 2016 As Vox Machina head into the Moonbrush, they are drafted into a battle between a pack of lycans and a village of pixies. Also, they make a pit stop at the Last Campsite of Sorudun the Happy. Everything goes well, obviously. Episode 62 - Uninviting Waters (live) Aug 6, 2016 With the Moonbrush behind them, Vox Machina presses on towards the rushing rivers of the Gilded Run that barricade the Shademirk Bog. Battling the enchanted currents, they stumble into a lurking foe who’s hunger knows no bounds! Episode 63 - The Echo Tree Aug 11, 2016 Vox Machina find the root of the pestilence deep within the Shademirk, and come face to face with the creature who holds the next vestige. Episode 64 - The Frigid Doom Aug 18, 2016 Vox Machina go on a secret mission to the decimated city of Draconia, in the hopes of learning more about the Chroma Conclave. Episode 65 - The Streets of Ank'Harel Aug 25, 2016 Vox Machina make their way to the distant continent of Marquet, traveling into the exotic city of Ank’Harel to seek allies and another vestige of power to aid in their war against the Chroma Conclave… and get slightly distracted. 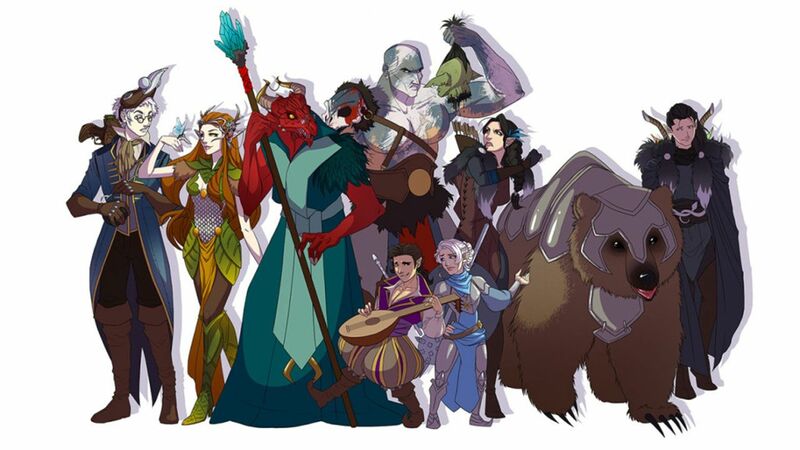 Episode 66 - A Traveler's Gamble Sep 8, 2016 Vox Machina request the help of J’mon Sa Ord in the upcoming battle against the Chroma Conclave and the whereabouts of Mistress Asharru are finally uncovered. Also Spice. Episode 67 - The Chase to Glintshore Sep 15, 2016 The chase is on as Vox Machina race towards the Island of Glass in search of a returning adversary! Episode 68 - Cloak and Dagger Sep 22, 2016 Vox Machine chases Dr. Ripley across the Island of Glass, but are they prepared for what she has in store? Episode 69 - Passed Through Fire Sep 29, 2016 Vox Machina return to Whitestone in a desperate attempt to save Percy, but there’s far more waiting for them than they bargained for.